Great experience. Wonderful staff and a fun time. Not for people looking to be quiet and relax!!! This hostel was fantastic! I felt my stuff and I were really safe the whole stay. The social life at this hostel was also amazing! The staff were so welcoming. I highly recommend going to the events they host! Turkish light and Oscar were great pub crawls guides and the clubs we went to were super fun. 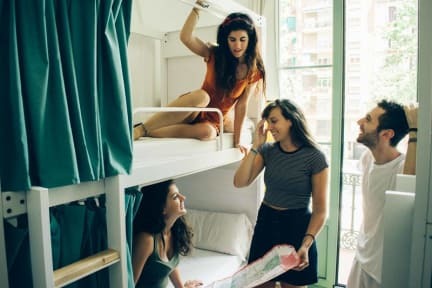 This hostel really made our stay in Barcelona the best! We joined the bar crawl and Flamenco show! The bar crawl’s three stops we’re not that great places compared to other options in Barcelona, but the great staff made sure we were all having fun! We also went on the light fountain guide and it was nice having people lead you that live in Barcelona! The bathroom stalls are tiny and it’s pretty tough to change, but lots of mirror and sink space made up for it! The beds were so comfy and they had curtains for privacy which was amazing. Great hostel and does exactly what it needs to. Lockers are a little busted so youll have to put work into using them and events they offer are only certain days of the week My wish is they would advertise ahead of time what specific days. The bed is comfortable. The curtains give a feeling of more intimacy. Yet, the room for 6 or 8 people is small. For me the worst are the toilets, they are very small and quite open to everyone so they don't give an intimacy feeling.